The International Institute for Sustainable Enterprise (India) was created in 2011 with a vision to create nothing less than a new model of business education and entrepreneurial training appropriate to the challenges we face in the 21st century. This reflects our belief that the transformation to sustainability is the biggest business challenge and opportunity in the history of capitalism. The mission of the International Institute for Sustainable Enterprise (India) is to dramatically increase the number and success of intrapreneurs and entrepreneurs focused on socially inclusive and environmentally sustainable business development for the 21st century. Priya Dasgupta is the Director of Strategic Initiatives at Emergent Institute. 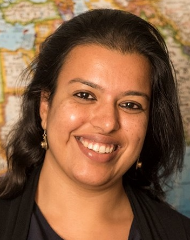 Priya has over seven years of experience in technology, management consulting and business development for the corporate sector and for social enterprises working with the rural and urban poor. Priya’s experience at the BoP includes fund management and advisory services for microfinance in Africa, enterprise creation for the informal waste sector in the Philippines, Brazil and Peru, design and implementation of a pilot Ultra Poor Initiative with the largest tribal group in India, design and implementation of a Ranking System for Indigenous Groups in the Latin America and Caribbean region among others.